I'd be cryin like that little girl in red... 18, huh? Well, I always wanted 11. To each their own as long as they are HAPPY. truly happy. They need to go on dates and football games and movies and NOTHING every once in a while too though. crazy. i think the kids, growing up with those responsibilities, probably don't chafe as much as others might think. Ya know, I bet those kids just don't know any better. As I recall, they are home schooled, yes? On the other hand, um, how happy can your kids make you if you don't know everything about them because one of your other kids is taking care of them? Also, if my family of 5 kids, two parents, a grand kid and our significant others (totaling 10 people) can't have a regular conversation at the dinner table, how do those guys do it? Yeah, I come from a large family (10 kids), and I just think it's tough to give good, quality one-on-one time with all of those kids. Not that the parents don't love them, but me personally - FOR ME personally - I think you should stop when you and your hubby can't personally take care of them all. But hey, to each their own! But PLEASE, Mrs. Duggar, consider losing the mullet! As Brandi would say, that just makes you look crazy cakes! That family is definitely different. My question is, what is their motivation for being on tv? I could not agree with you more. I think the kids are used to caring for the younger ones but it is just sad that the parents aren't the primary care givers. Their situation is a true example of a "baby factory". I love the duggars! because they are not mormon and because they are not amish or polygamists and they still find raise their families in such a great way. i think and work and responsibity make kids happy. i think all this free time that we give ourselves and our kids causes depression and other mental illness. so the fact that each kid is responsible for another is great. they are still educated and they still dont work nearly as much as people did in the old days because we have electricity, indoor plumbing, washer and dryers, etc. so the older kids dont seem deprived or overworked to me. my kids seem underworked and overindulged to me. i still think mrs dugger is busy and hardworking, and i on the other hand waste a lot of time. so i wish my family including my kids would be more like the duggers, though i have no plans to have 18 children. i think having a small child keeps us busier and therefore out of mischief, maybe that's why i'm considering another baby. I LOVE that show and I keep wondering why it doesn't show up on my DVR as often as I think it should. I personally think they're living the way God intended. Mom and Dad don't have to -- and shouldn't -- have to micromanage their children. I think it's beautiful the way their children are learning responsibility and love, by living naturally, avoiding TV, video games. Just an awesome family. Grr. I just discovered that hubby deleted my series recording for that show. Serves me right though. I deleted his Planet of the Apes marathon. Just to clarify--I love the values that the Duggars instill in their children. I agree that they are living the way God intends. I agree that hard work and responsibility are good for children. 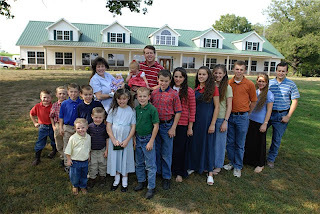 My one and only beef with the Duggars is that the older children are not just helping out--they are fully and completely raising at least one of their younger siblings. I think that's an unfair responsibility to lay on a 12 year old.